ElastiJoint Review – Is This Product Safe To Use? 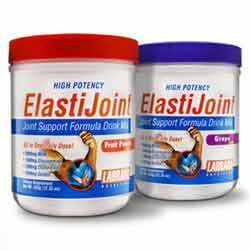 ElastiJoint is a brand of joint health supplement that comes in drink form. Primarily developed as a pain and stiffness alleviator for people with active lifestyles that include regular exercise regimens, ElastiJoint also caters to an older demographic dealing with bone conditions like osteo-arthritis and acts as a strengthening agent and tool for joint health maintenance. ElastiJoint can be acquired through the product’s official website, where its full list of ingredients is published. Although the manufacturer claims that the product has gone through clinical testing, there are no customer reviews cited on the website. A 1-month money-back guarantee is also offered, provided that the returned merchandise remains unused. ElastiJoint comes in powder form that goes with water or any other type of beverage and is available in either fruit punch or grape flavor. The complete list of ingredients is published on the official website, three of them are Glucosamine, Chondroitin, and MSM—all well-known components usually found in various joint supplement brands. More information about studies performed on these ingredients is available on the site as well, but there aren’t any customer testimonials referenced. ElastiJoint promises to cater to both the young and the older demographic by addressing their joint pains. Though the formula of ElastiJoint contains 3 proven ingredients that are tried and tested, the absence of customer feedback on the website might discourage some users from buying the product. Furthermore, the money-back guarantee seems to be a useless perk because for it to be honored, the returned merchandise needs to be completely unused—what happens if the consumer tries it and then decides it’s not suited to their needs? That could be a deal breaker for serious buyers.